All-rounder Ravindra Jadeja gave India the first breakthrough after lunch by removing Broad from the attack with Buttler following suit. 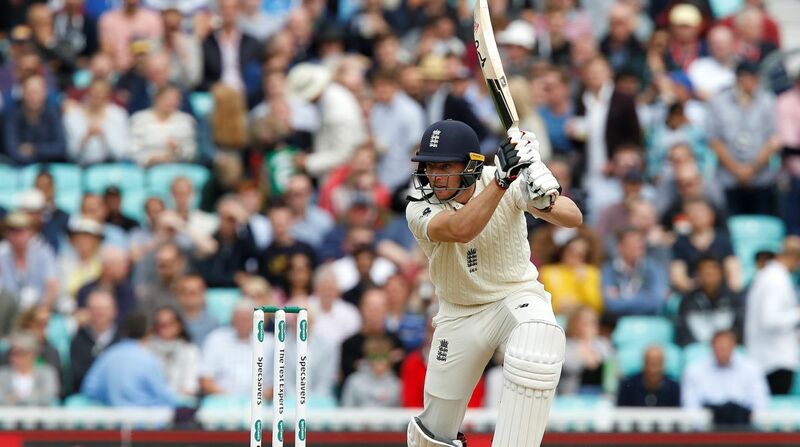 Joe Root-led England cricket team were bowled out for 332 runs in the first innings of the fifth and last Test match at the Oval on Saturday. Resuming the day at 198/7, England lost Adil Rashid in the first session on the second day. However, pacer Stuart Broad and Jos Buttler put up a crucial 90-run partnership to take England to 304/8 at lunch. Earlier on Friday, Alastair Cook missed out on a century as England threw away a decent start to huff and puff their way to 198/7 and Indian bowlers came up with a captivating first day performance in the fifth Test. Cook, who called time on his illustrious career before the final rubber, was the top scorer for the hosts with a patient 71 off 190 balls before he was removed by Jasprit Bumrah. Joe Root won the toss and elected to bat first. All-rounder Moeen Ali, batting at No.3, got to a dogged 50 off 170 balls as well but India came roaring back in the third session, after struggling to get wickets in the first two, to reduce England to 198/7 from 60/0 at one stage. Pace spearhead Ishant Sharma returned best figures of 3/28, while Ravindra Jadeja – playing his first match of the series – and Bumrah grabbed two wickets each conceding 57 and 41 runs, respectively. At stumps, Jos Buttler (11 batting) and Adil Rashid (4 batting) were at the crease. Cook looked good for his 71, playing some glorious cover drives and pulling and hooking with elan to roll back time. Along with Keaton Jennings (23), the pair had brought up the highest opening stand in the series. But Jadeja broke the association with a wicket-to-wicket delivery that flew to leg slip off the face of the bat for KL Rahul to take the catch. Cook then tried to stitch another partnership with Moeen but Bumrah got the ball to jag back in and disturb the stumps. Bumrah sent captain Root back in his next delivery with Ishant then dismissing wicketkeeper Jonny Bairstow (0) in the next over to reduce the hosts to 134-4. Moeen tried to steady the ship but Ishant returned to take two wickets in three balls in the 83rd over as England further slipped to 181 for 7. The hosts lost six wickets for 58 runs post tea to collapse from 133-1 to 181-7. Ishant got Bairstow out caught behind and Ben Stokes (11) and Ali put on 37 runs for the fifth wicket before Jadeja began the slide again trapping Stokes lbw. Ali nicked Ishant behind after a resolute show with Sam Curran (0) dismissed for a duck, the batsman edging behind as he looked to leave the ball. Shami bowled a threatening spell, but Jos Buttler (11*) and Adil Rashid (4*) survived till the end somehow.